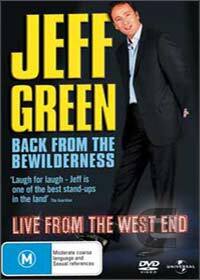 Apart from having one of the longest DVD titles to date, Jeff Green back from the Bewilderness, Live from the West End stars Jeff Green in his classic one night only performance from the West End. Perrier Award Winner Jeff Green talks about almost everything in this performance from pop culture to politics in his unique and quirkiness methodology. The thing is with Jeff Green, either you love him or hate him so it's quite hard to rate this DVD. For me, the DVD was quite amusing, although a little stagnant at times but if it made me laugh from the belly, than he has done something right. Definitely one for those who enjoy stand up comedy.